There is something wild and exotic about hopping on a private jet and being whisked away to a far-flung South Pacific island. 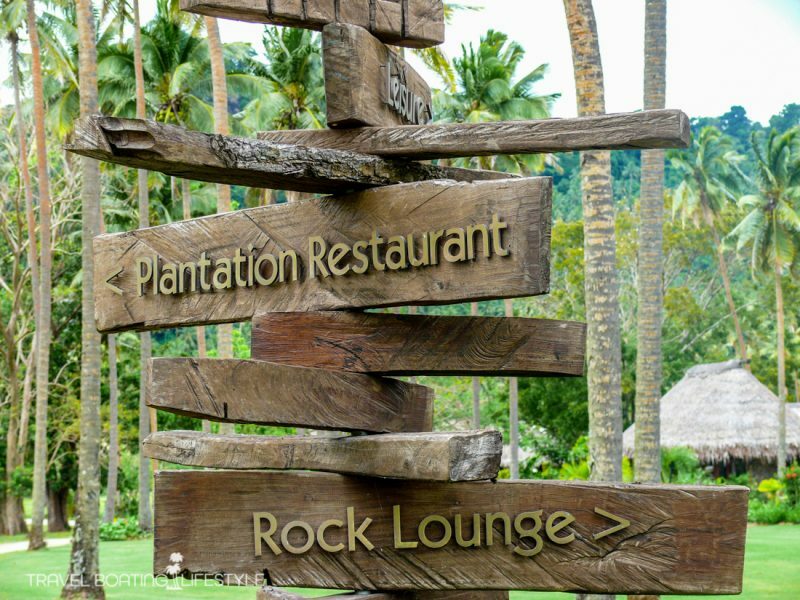 Particularly so when your destination is a Fijian island retreat regularly cited as one of the 100 most beautiful hotels and resorts in the world. But what exactly defines such a high-end resort? 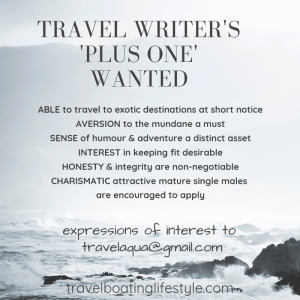 What is it that allows Laucala Island to ascend above a very crowded field of highly credentialed contenders? Sure, at this level of excellence, exceptional service, extraordinary cuisine, a fine wine cellar, exquisite surroundings, combined with enough leisure and cultural options to suit the most fastidious guest are de rigueur. Some would say, if you’ve seen one fine resort, you’ve seen them all. 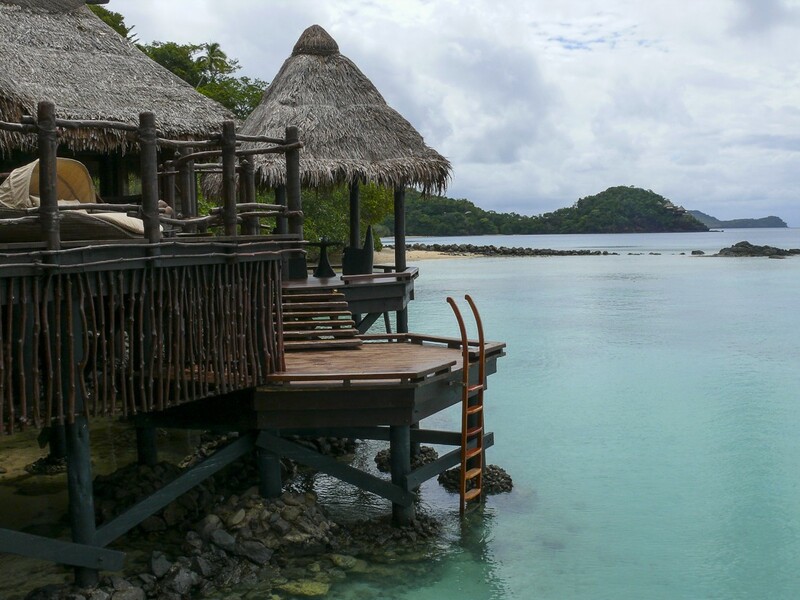 In Laucala Island’s case (pronounced Lor-thar-lar), however, you’d also be wrong. 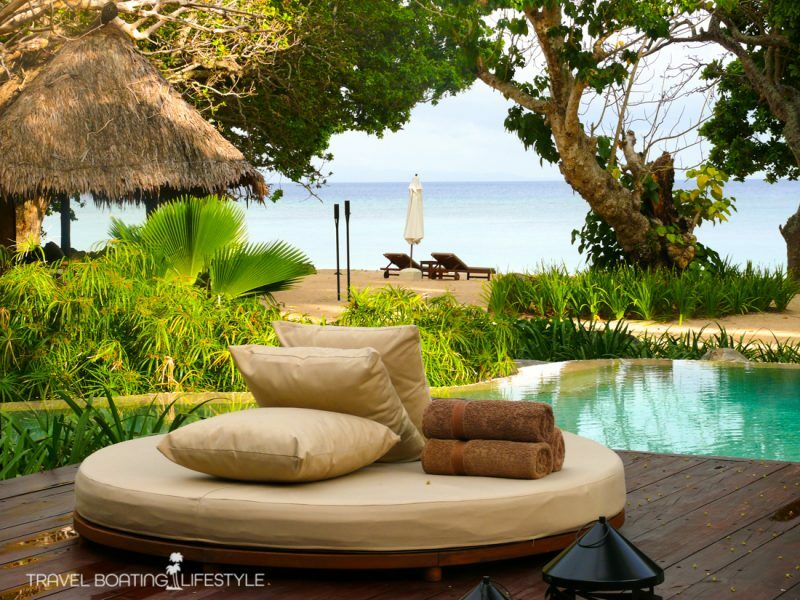 Hideaway Hotels travel guides allocates Laucala seven stars, an unquantifiable rating as there is no such category. But I understand their sentiment: Laucala is simply so unique, raising the bar far beyond mere exceptional, that words are somewhat inadequate. Against a backdrop of manicured coconut plantation silhouetted against a cerulean sea, Laucala has the goods. It’s one of the most exquisite hotel resorts I’ve had the pleasure to stay in – over a lifetime of travelling I’ve stayed in many! Laucala Island manages its own airline (with a hangar-side fully serviced corporate lounge in Nadi enabling guests arriving on international commercial flights to complete arrival formalities in privacy), has a fleet of vessels docked in the marina for guest use, is a Customs Clearance Port with rights over the surrounding air and sea traffic, and that it has built a self sustaining village on neighbouring Qamea Island to house over 300 staff and it quickly becomes apparent that Laucala is far from your average luxury resort. With just 25 residences (for a maximum of 80 guests), built around 27 swimming pools oriented for maximum privacy, it’s highly likely that you won’t see any other guests during your stay. Particularly if you take up the Destination Dining option, just one significant element of the all inclusive tariff. Beyond mere room service, in villa dining involves a culinary team of at least six staff to prepare, cook, serve and clear. If you’re not sure which of the champagnes in your villa’s fridge is an appropriate accompaniment, the Sommelier will obligingly offer his recommendation, which naturally is served in bottomless fine crystal glasses, no matter whether it’s breakfast or dinner time. 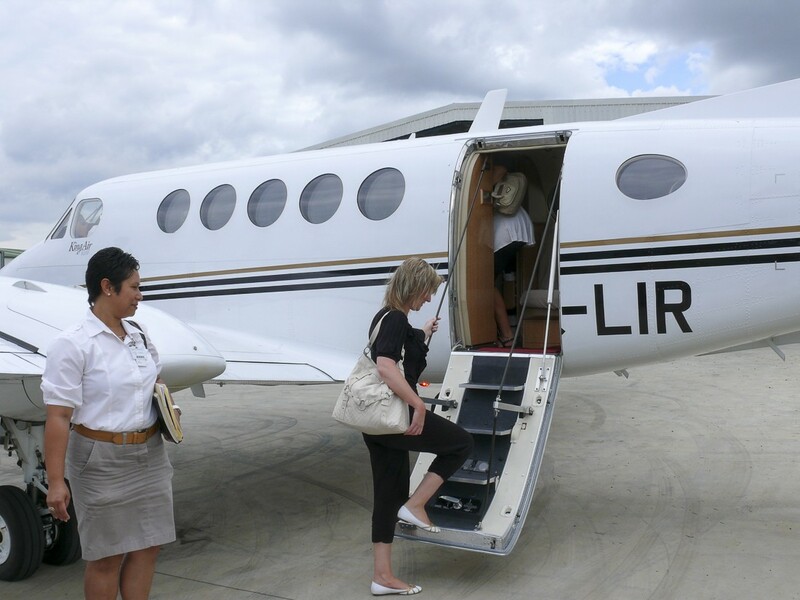 In fact, so discreet is Laucala Island, 45 minutes from Nadi in the King Air Beechcraft B200 Turboprop aircraft, that guests don’t actually make a reservation so much as submit an application to visit. You’ll need to come with your credentials highly polished of course: simply because you can afford to shell out upwards of 3800USD per night, doesn’t guarantee that you’ll be invited to stay. Sounds a bit snooty and exclusive? 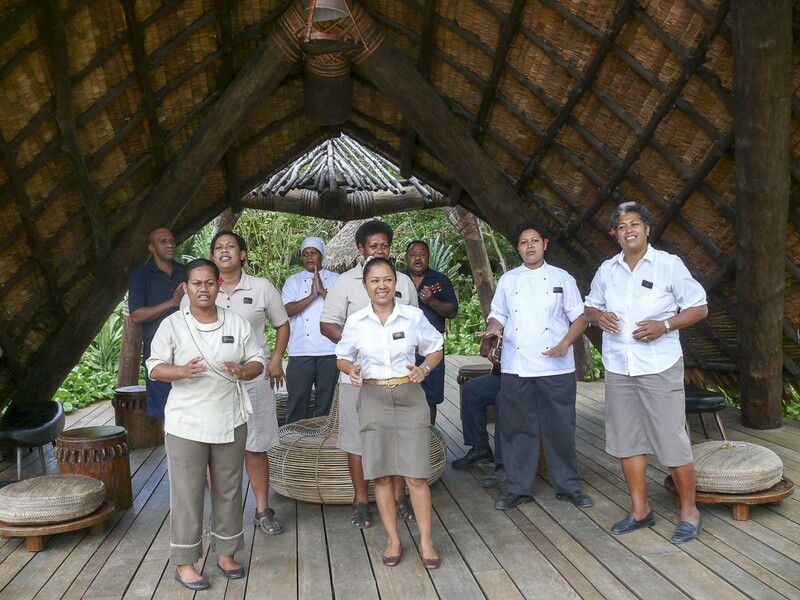 Well yes, it does, but Laucala is all about creating extraordinary, personalised guest experiences, anticipating, and then meeting guests’ every need. It’s about discretion, opulence and the very finest service ethos. 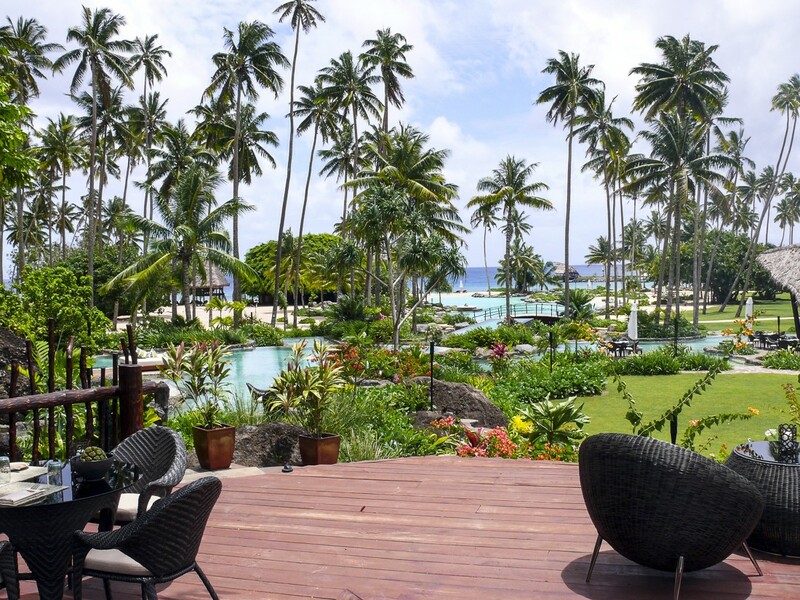 In keeping with the warm nature of Fijian hospitality, it is far from snooty. Rather, it is intimate, elegant and oh so indulgent. 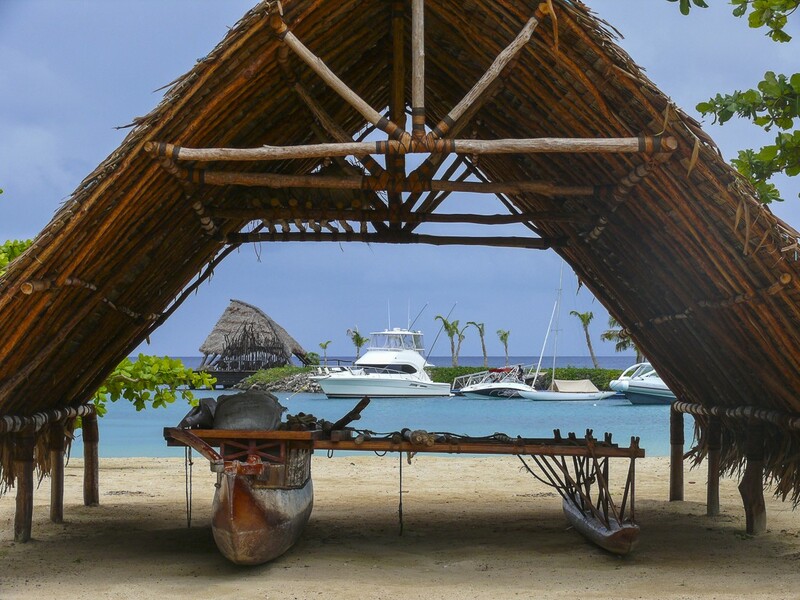 Significantly, superyacht owners and their crew are welcome, utilising the islands status as a port of sufferance to enable vessel owners to clear into or out of Fiji without the hassle of Suva customs formalities. Currently there are two deepwater superyacht moorings just off the fluffy white sand beach with plans to expand the marina breakwater and floating pier to permit large vessels to berth dockside. Fuel and provisioning can be provided, while emergency maintenance or repairs can also be undertaken. Crew can also be accommodated in house if required, while owners jet in and out, making it a delightfully exotic South Pacific yacht base with the Lau Group offering pristine cruising grounds nearby. The single Overwater Residence is designed to suit water babies who like to roll out of their bed and into a cerulean sea of a morning. With water depth around five metres through the reef strewn channel, along with a 15 metre dock abutting the two bedroom residence that sits atop the rock face, guests can come and go by boat. Of course there are also a couple of electric Club Cars in the thatched roof garage for getting around on land. The swimming pool, carved into the natural rock face is accessed by overwater boardwalks that link the living, bathing and sleeping pavilions. Taking full advantage of cooling ocean breezes, walls disappear, allowing the sounds, smells and colours of the Pacific to waft through. Open sided indoor bathrooms are merely delineated from bedrooms by stone floors beneath a pitched roof with enormous overhead rain-shower rose. Just as in the outdoor bathrooms and dining pavilion, spaces meld seamlessly with one another, with a profusion of jungle-like garden linking suspended boardwalks as the only real indicator where one room ends and another begins. As with all the restaurants, bars and secluded lounging pavilions scattered across the northern reaches of the island, all materials and furnishings are handcrafted from indigenous woods. Family sized baths and bathroom vanities are made either from Fijian hardwood or imported granite. Seagrass Restaurant on the peninsula and Rock Lounge on the waterfront cliffs, both have ample cosy corners for lounging and dining. Secret canoodling couches are concealed behind enormous polished tree roots, while private bathroom cubicles are positioned to maximise the view over the Pacific Ocean. Hand basins at the Beach Bar are hand carved from enormous fallen trees, while at dusk, tiki torch flames dance across the water beyond. Chilling out at Rock Lounge high above Seagrass Bay, the Fijian folk song espousing “beautiful hours are for eternity” comes to mind. With dreamy views and a chill out atmosphere that invites intimacy on the low slung couches set around polished tree root tables, it’s an elixir for the soul type of place. Alone and melancholy as dusk descends, with a mint infused Mojito in hand, I feel oddly lonely as the sun is replaced by a swoosh of flickering, mesmerising flame atop the rock walled open air bar. Seeking empathy, I ring a close friend back home, who is decidedly unsympathetic to my plight. Fortunately a broad Fijian smile followed by a welcoming ‘’Bula’’ is enough to bring me around as I retreat to Plantation House for dinner. Positioned beneath coconut trees, the dazzling white mansion replicating the original colonial plantation style of architecture represents fine cuisine, wine and hospitality. Dining at Plantation House is like an intriguing journey through divine culinary artistry. Each course of the degustation menu offers tantalising morsels of deliciousness: lobster and champagne risotto, soya marinated chicken lollypop and lime and coconut sorbet. Each delectable dish is complimented by appropriately fine wines. A discreet question to each guest before arrival had ascertained any food allergies or preferences, ensuring that guests are not embarrassed nor inconvenienced by inappropriate offerings. 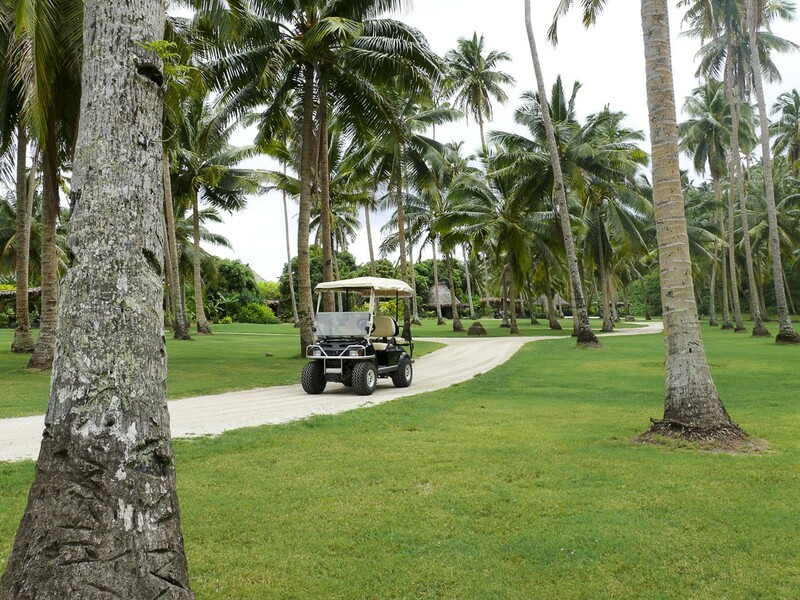 As with much of Laucala, it is this discreet attention to detail that is extraordinary. Upon arrival, guests are invited to a personal cocktail sunset cruise onboard the Riviera 41. Resort Management welcome guests personally while discreetly assessing guests particular desires, whether they want to be entertained or simply left alone. While the front of house facilities and services are beyond reproach, it’s the background infrastructure supporting the islands’ total independence and sustainability that is quite remarkable. In developing an intimate private retreat, the islands’ owner, an Austrian businessman with a penchant for fast cars, required that the island to be totally self sufficient. From power plants, water makers, fully developed animal farm with breeding programme, egg hatchery, vegetable and herb gardens, fruit orchard, hydroponic nursery and bee hives, along with a seafood harvesting programme, every possible need is catered for. There’s even a program to utilise wild goats and bush turkeys that roam the island. By producing everything themselves, the island is not dependent on fresh produce being flown in, immediately giving themselves an edge over other remote island resorts. Just one advantage of the owner’s very deep pockets. There’s also a full medical centre with doctor and nurse, a staff marina positioned well away from guests, with boats plying to and fro between Laucala and Qamea Islands, laundries, mechanical and maintenance workshops. All of which guests are welcome to visit, if they so desire. But most guests don’t venture much further than the 18 hole golf course, the marina and outlying waters and reef for sailing, scuba and game fishing, or past the horse stables which have their own bar for post ride refreshments. There are simply too many aspects of Laucala to explore, to truly reach into the island’s soul in just a few days. And with such expansive guest Residences, such as the one I’m ensconced in with swimming pool, massage and dining pavilions, four bathrooms (two indoors and two outdoors), four fridges stocked with wine, champagne, snacks and freshly squeezed fruit smoothies replenished throughout the day, along with private beach and an unbroken Pacific horizon, it’s a bit of a stretch even venturing beyond my own villa walls. Disbelievingly before arriving, I had scoffed when it was suggested that staying on Laucala was like being personally welcomed into a large, warm family. Just like the cynics who suggest one luxury resort is as good as another, I was proved wrong. Hopping onboard the jet back to Nadi it was as though I was leaving a part of my own soul behind. Rhythmical Fijian voices lifted heavenwards in unison as the traditional farewell song Nisa Lei hung in the breeze. As the voices softened, one gentleman stepped forward into the emotion charged atmosphere and quietly explained the significance of the song, asked us to travel with peace and good wishes. With a heartfelt “Thank you for coming to stay,’’ ringing in my ears, Mr Erkhard, the Sommelier who had presided over dinner the previous night, stepped forward softly, discreetly proffering a tissue box amongst emotional, departing guests. While much of Laucala is remarkable, it is this anticipation and intuition that ensures Laucala will feature in many future ‘best of’ lists. 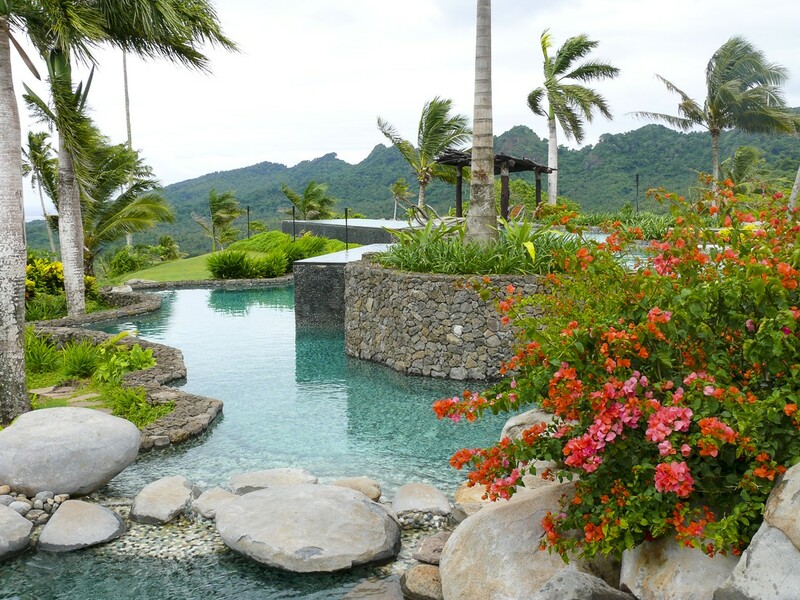 Redefining excellence, perfection has a new location in north eastern Fiji. Sure, you’ll need to put aside some hard-earned dollars to make the journey. But what’s the point of putting in the hard yards at work if you can’t splurge a little sometime, hmm? Opinion: If you’ve the holiday budget required, it’s likely to be the holiday you’ll never forget. Exceptional attention to detail and outstanding service set Laucala Island well above anywhere I’ve ever stayed. 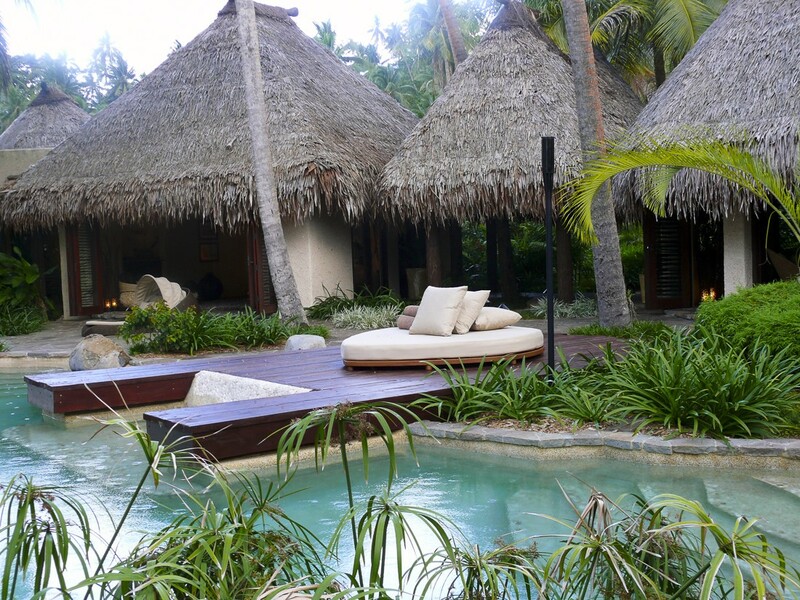 If there was such a thing as 7 Star rating, Laucala is well qualified. great photos and interesting story. Thanks Claudie – I’m glad you enjoyed it!